← Did We Just Witness The Dawning Of The Age Of Bachmann? Does Sarah Palin Read Lynnrockets’ Blast-Off? Boy, what a coincidence. Or was it? Remember, Sarah Palin says that she does not believe in coincidences. Nevertheless, it is peculiar that on the very evening after we posted a blog entry which postulated that potential G.O.P. presidential nominee rivals Sarah Palin and Michele Bachmann may be in a cat-fight of iced-tea proportions, Palin appears on Fox News (where else?) and purrs complementary sweet nothings in the direction of Bachmann. You have to wonder, does palin ever find herself humming along to any of those song parodies? Probably not, but it would be humorous! We wrote yesterday that the throne of the Tea Party is in dispute. Sarah Palin, the former ex-quitting half-term Governor of Alaska held the title of Queen of the Tea Baggers from the movement’s inception right on up to her disastrous “I Was The Actual Victim Of The Tucson Massacre” speech. Palin’s reign of terror was publicly broadcast to America on a near daily basis by means of her Facebook posts, Twitter tweets, Fox News appearances and her un-reality television series. Her hogging of the national “lamestream” media spotlight ensured that she was perceived as the undisputed champion of the radical, educationally challenged, colonial attire-wearing, gun-toting, hateful rhetoric-spewing, right-wing gang of zealots known as the Tea Party. During that time however, Teapublican Congresswoman Michele Bachmann was planning her coup. Bachmann shared all the same misguided beliefs and encouraged all the same ill-conceived policies as Palin and the Tea Baggers, but she was not in everyone’s face all the time. Moreover, Bachmann was different from Palin because she is one of those “inside the beltway” Washington insiders inasmuch as she is in her third term as a Representative from Minnesota. Indeed, it was Bachmann who attempted to round up all the other like-minded Washington insiders when she formed the congressional Tea Party caucus. Bachmann seemed to be waiting for the moment when Palin slipped, at which point she would seize control of the Tea Baggers. That moment arose on January 8, 2011 when Representative Gabrielle Giffords and others were shot in Tucson. The shooting immediately focused criticism on Palin for her eerily predictive sniper-sight laden map which identified Ms. Giffords as a target. Inasmuch as Palin was so intrinsically tied to the Tea Party, that movement also came under fire from many Americans. Palin went into hiding after her appearance on “Hannity” in which she unsuccessfully tried to rehabilitate her image. The Tea Party in turn, realized that if it was to maintain any type of credibility it should distance itself from Palin for awhile until things cooled off. Bachmann then seized the opportunity to grab the Tea Party spotlight. Her coup was completed when she (not Palin) gave the official Tea Party response to President Obama’s State of the Union Address on Tuesday evening. As we said yesterday morning, we may have just witnessed the dawning of the age of Bachmann. Sarah Palin’s efforts may have at least won over one unlikely person. Although she has been one of Palin’s most outspoken critics, Meghan McCain (daughter of John McCain) apparently likes Michele Bachmann even less. In a very backhanded complement to Caribou Barbie, she called Bachmann “a poor man’s Sarah Palin” on MSNBC last evening (see below). Whether Sarah Palin’s overture of support to Michele Bachmann has won over any Tea Baggers remains to be seen. 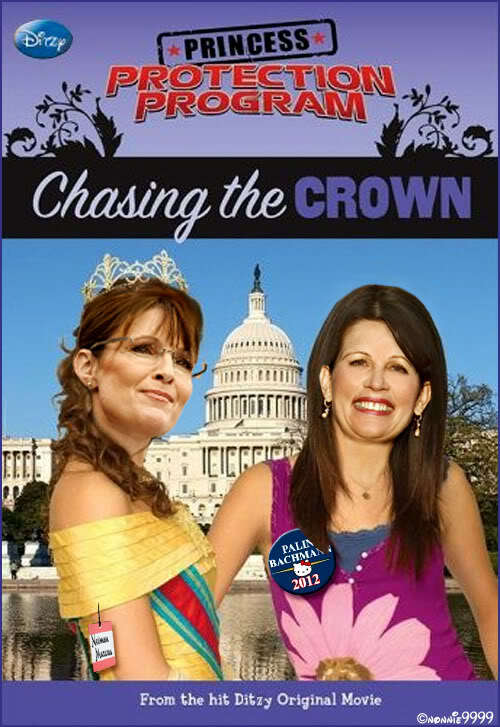 For all intents and purposes, Bachmann remains the new reigning monarch of the Tea Party. For now. Posted on January 27, 2011, in Fox News, Greta Van Susteren, John Boehner, Michele Bachmann, Republican, Sarah Palin, Sean Hannity, Songs, Tea Party and tagged Fox News, Greta Van Susteren, Meghan McCain, Michele Bachmann, MSNBC, news, palin, Republican, Sarah Palin, Sean Hannity, Songs, Tea Party, Tea-Baggers. Bookmark the permalink. 10 Comments. Greta was kind enough not to bring up the salacious “Todd caught banging Hos” stories that have been swirling around during Mama Grifter’s involuntary hibernation and let her have her own- unmistakably low class- SOTU rebuttal which consisted, basically, of one big “What the F#ck!”. Apparently Palin does read the blogs! No Sputnik moment for us! Everybody knows the Soviets went broke due to excessive military spending to protect their freedom of speech in Afghanistan! Unbelievable, well actually not. Invest in education, infrastructure, clean energy? Are you kidding? WTF – Let them eat cake donuts! Nice choice, BP. I like anything from a former member of Rockpile. This pic needs to be updated with ‘WTF’ on it. Love to have this as a bumper sticker :)! Do you think she actually reads?!?! Sure she does. She has a subscription to “All of ’em, Any of ’em”!